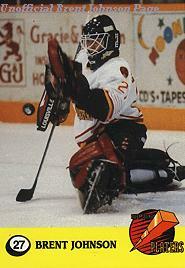 Brent Johnson played for the Owen Sound Platers from the 1994-95 season to the 1996-97 season. 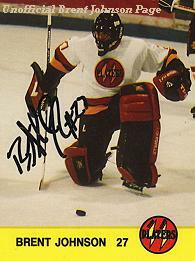 During that time Brent played in 126 games and had a record of 47-65-3. This part of the site is about Brent's OHL career. Here you will find pictures and some other information on Brent's time in Owen Sound. If you have any pictures, articles, etc. on Brent's junior hockey career please e-mail me at IceCat1232@aol.com because this stuff is tough to find. I'd like to thank Dave Marshall for his contributions to this page. The Owen Sound Platers were founded in 1982 as the Guelph Platers. 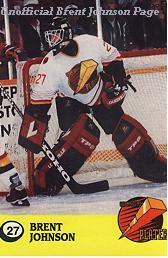 In 1989 they were moved to Owen Sound and this past year the team name was changed from the Owen Sound Platers to the Owen Sound Attack.